What is the incubation period for malaria? How long does malaria last, and how long will it take to be cured of malaria? When should people seek medical care for a suspected malaria infection? Malaria is an infectious disease caused by parasites that invade red blood cells. The protozoan parasites are among several species of the genus Plasmodium. This malaria parasite is transmitted by mosquitoes (vectors) to humans through mosquito bites that, during the bite, release parasites into the person's blood. Malaria is characterized by cycles of chills, high fever, and sweating. No, malaria is not contagious. Malaria is not spread from person to person and is not sexually transmitted. Malaria is not contagious through casual contact or through kissing. It is not considered a sexual transmitted disease (STD). Malaria is transmitted from mosquitoes to humans. There is one strain of the parasite Plasmodium, P. knowlesi, that can be transmitted from monkeys (macaques) by mosquitoes to humans and is termed "zoonotic" malaria. The time period from initial parasite infection to the appearance of symptoms varies according to the particular species of Plasmodium that infects an individual. For example, P. malariae ranges from about 18-40 days, while P. falciparum ranges from nine to 14 days, and 12-18 days for P. vivax and P. ovale. Initial symptoms of malaria may include shaking chills, high fevers, sweating, headaches, nausea and vomiting, anemia, and/or diarrhea. Diagnostic tests include microscopic examination of the blood for the presence of parasites, serology, PCR testing, and other tests that determine if the parasite is resistant to certain drugs. Travelers returning from malaria-endemic areas should remind health-care providers about their travels for at least one year after they have returned from that area of the world to avoid potentially missing the diagnosis of the disease. The majority of malarial infections are spread or transmitted to humans by infected mosquitoes that take a blood meal from humans. During this blood meal, Plasmodium parasites are regurgitated by the mosquito into the person's blood vessels. The parasites require both mosquitoes and humans to go through a complete and complex lifecycle that involves several life stages for development and maturation of the parasites. Malaria is not transmitted person to person. Although it is an infectious disease, it is not communicable in most instances to uninfected individuals. It is possible to transmit malaria through blood transfusions, to a fetus, or by organ donation. However, control measures have markedly reduced such transmissions. 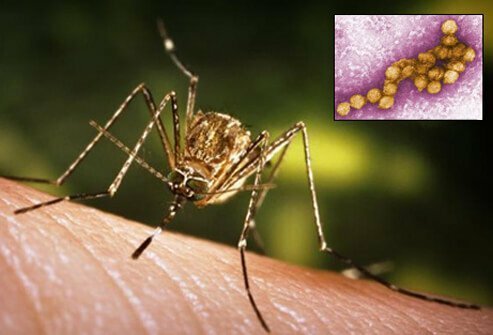 Treatment of malaria depends on the number of different factors that include disease severity, the particular species of Plasmodium infecting the patient and the potential for drug resistance of the various species and strains of Plasmodium. In general, it takes about two weeks of treatment to be cured of malaria. However, in some individuals, relapses are possible. If an individual has visited or lived in an area where malaria is endemic (including parts of Africa, Asia, and Latin America) and subsequently develops a headache, high fever that comes and goes, fatigue, body aches, and/or shaking chills (rigors) and cough, he or she should seek immediate medical attention. Patients should tell medical caregivers if they have lived in or traveled to areas where malaria is endemic. This will help the medical caregivers to order appropriate tests to confirm malaria. The most severe problems (pulmonary edema, kidney failure, brain injury, death) are seen mainly with P. falciparum infections. Herchline, Thomas E. "Malaria." Medscape.com. May 11, 2018. <http://emedicine.medscape.com/article/221134-overview>. United States. Centers for Disease Control and Prevention. "Malaria." June 26, 2018. <https://www.cdc.gov/malaria/>. What prompted you to seek medical care? Dosage, drug interactions, and pregnancy and breastfeeding safety information should be reviewed prior to taking this drug. Pyrimethamine (Daraprim) is a drug prescribed to treat Toxoplasma gondii (toxoplasmosis) and plasmodia (malaria) infections. Side effects, drug interactions, dosing, storage, and pregnancy and breastfeeding information should be reviewed prior to taking any medication.